1) Release negative ions:It is proved that salt lamp crystal can emit ions to the surrounding, and the main production is negative ions. Salt lamps absorb water from the air, then evaporate,then absorb water,then evaporate, in the process of continuous produce ions. 2)Radiation protection: After the salt lamp is lit, it releases the frequency called "Schumann wave", can naturally adjust and inhibit the high-frequency electromagnetic waves generated by electrical appliances. 3)Purify air& kill bacteria: Salt lamps can remove smoke and odor from the air,absorb and remove dust mites in the air, pollen, mold spores, bacteria and so on. It can also adjust allergies, asthma and other common diseases of children, while regulating the immune system. 4) Relieve stress: Pressure makes people often in tension and anxiety, if it lasts for a long time,it will badly affect mental and physical health. By the soft light,it can create a comfortable and relaxed environment. 5)Turning off the lamp is not suggested or it will absorb moisture and cause moisture condensation. [SALT LAMP MATERIAL & SPECIFICATION]： Each lamp is made by hand carved from 100% Himalayan Salt Crystal, so each one styling is unique and natural. 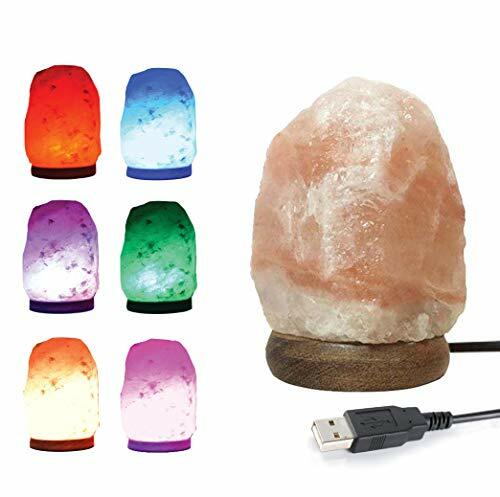 This USB salt lamp is about 4.7 in/ 12 cm, weight is about 1.5 lbs/ 700 g. Our salt lamps are imported from Pakistan, choose the good quality crystal rock salt, the Neem wood of base known for its durable and termite free properties. Not only ensure its unique chemical composition will not be changed, but also the appearance is more natural. [SALT LAMP SAFETY PERFORMANCE]: Salt lamp interior has been installed the LED Light Bulb with the USB Cord. The length of Salt Lamp Cord is about 54 Inch, let you plug in the salt lamp without the distance trouble. HOMY Salt lamps are ETL Approved.This style Salt Lamp is small size and using the LED Bulbs of 3Watts, so the surface heat is impossible feeling touch from human body. If the salt lamp give out heat, which will have the hidden scald dangers to your pet and children. [The FEATURES OF MULTI COLOR KEEP CHANGING]: It contains 84 kinds of non-contaminated natural minerals and trace elements. Suitable for people who sit for a long time. This salt lamp has multi-color changing function. Once lit this salt lamp, the LED light will emit a calming Amber color and will automatically slowly switch colors between: Orange, Blue, Pink, Red, and Green. It has LED light inside, no need for you to install, great decoration for home and office, small size, saving space. [IDEAL GIFT AND HOME DECOR ]: HOMY Natural Multi Color Changing Salt Lamp is a calming, soothing and cozy table lamp to light up the whole room. Some bought one lamp at home but more bought several lamps for their loved families, lover and friends on Valentine's Day, Mother's Day, Christmas, thank-yous, graduation, birthday, Thanks Giving, and special occasions. Our salt lamps balanced with a nice visual sensation, embrace visitors and friends in a non-stressful, recharging moment. If you have any questions about this product by HOMY, contact us by completing and submitting the form below. If you are looking for a specif part number, please include it with your message.